Here we are at stage 2, another dark Acrylic wash and now some watercolor color. I really like washing the watercolor over the Acrylic, it's so nice to glaze and it not disrupt what's beneath. Next post : Friday, more darks and some finishing. I've had to pause my foray into oils due to some impending deadlines so for this week I'll take you through a portrait utilizing a method (new to me) of Acrylic glazes and watercolor. I truthfully had not expected it to work as well as it did since Acrylic forms a sort of plastic when it dries. Even so the process has been enjoyable and I hope you'll be pleased to see the results develop over the week. Next post : Wednesday, darker dark glazes and color washes. You can bit and run but you can't hide! "bit and run" has returned! 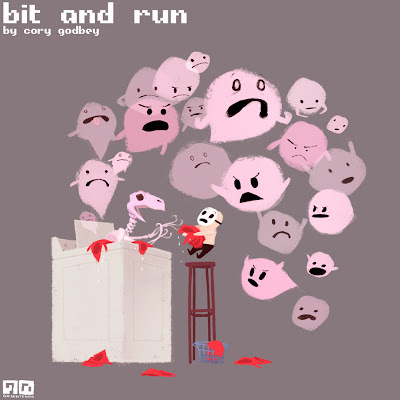 "bit and run" Volume Two here! Hey everyone, once again I want to take a moment and thank you all. I've said it many times before but I'll say it again, it's truly been a pleasure for me to do these comics. 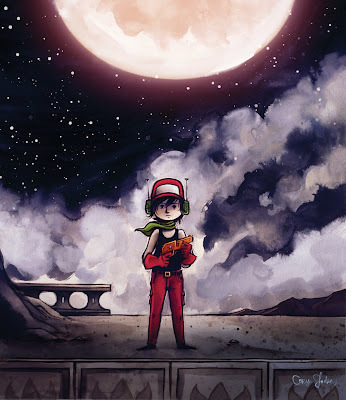 I'm especially gleeful for this one, the final installment of Volume One, because in a way it's a small fulfillment of one of those childhood wishes -- I used to draw out Mario levels and characters on graph paper. I'd move them around and make the little paper Mario jump on the paper Goombas and think, "Man, I wish I could record this." Fast forward some 20 years later and I've finally gotten around to doing something like it. Here's to the 6 year old in your past who always liked to draw cartoons. "bit and run" will return on Friday, August 6th with Volume Two. I'm very excited to bring out "bit and run" 13 this Friday. It's not only the final installment of Volume 1 of my "bit and run" comics, it's also different from any previous comic in that it's animated. These things have been so much fun to make, I'm going to miss working on them. 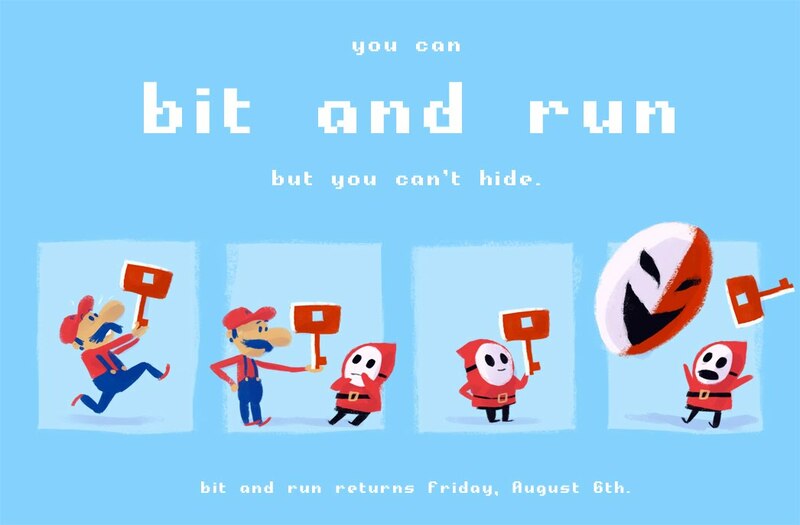 Look for "bit and run" 13 this Friday! Ok! So, we've been on a little trek here, haven't we? I can say for certainty that "new method practice" has really turned into just that, I have never worked this way before. 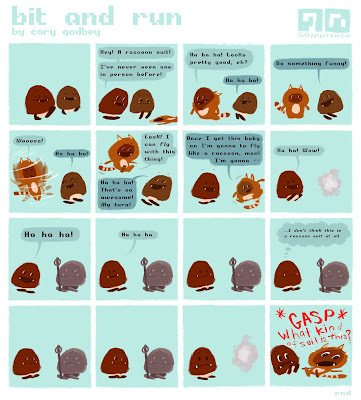 Here's what's happened with it since our last episode -- Remember the darker, richer glaze? I liked it very much, however, it nearly wiped out the drawing underneath, which was my whole reason for experimenting with this Acrylic glazes, right? No problem, I'll just use a little Gamsol and clean some off and -- !! -- there goes not only my glazes but my pencil. Note, this happened over a couple times, not all at once which goes to show I'm just stumbling around figuring this out. Stage 1. This was nice but too dark, I needed to paint in the figures. Stage 2. At this point I felt like I had melted down Jolly Ranchers and was painting with them.That might sound bad but I mean it to say that after the introduction of some Galkyd I felt like I was painting with melted hard candy. It was awesome. I'm pretty happy with what's happened, even though it's so far off base of what I was originally planning. PS. Here's a video of my nephew and me sword fighting over the weekend. Man, I can't believe that we've already arrived at the penultimate installment of bit and run. It seems like only last night I was bleary-eyed and playing Mario 2 in the early hours of the morning thinking up all this nonsense. Anyway, I wanted to take a moment and thank you all again. It's truly been a pleasure for me to do and I'm glad for the chance that it might have made you guys smile. Next week for the final installment of "bit and run" Volume 1, I'm going to do something a little different. I think you're going to like it. What is "bit and run" ? Check out my debut post here. download my set of 10 classic Nintendo inspired desktops! So I'm either bringing you all along with me on a bright, glorious journey of discovery or a horrifying expedition in the darkest, most foul heart of the unknown. Well. Who can say for sure. What I am hoping is that at very, very least I'll end up with a finished piece worth having watched develop. Most people I know who blog painting progressions do so once the work is completed and they trickle out the documentation. I've certainly done that and that's probably the best way to handle it. With this one, however, we are in almost real time. I remembered hearing some ancient bit of knowledge that it is possible to paint oil on top of acrylic and so I commenced to scatter all of my cautions to the winds and dive in with oil. I began to glaze in a richer, darker blue. Here's the final, smoother glaze. It was hard get a good picture with the shiny oil and my incredibly bright lamp. What I can't yet tell is if I should have left well enough alone or what. Though I am pleased with the more rich overall color. That, and I've got the clouds pushed back to what I originally wanted. The next step is bringing back the highlights. Ok, so here we have a few progress photographs of this new Acrylic method. It took me a while to get the hang of the way Acrylic paints but I feel like I started to get it towards the end of this session. I decided with this first one to focus not on color but on painting technique. Once again a huge thank you to the lovely and talented Annie for helping me learn. Second glaze, with a little dabbed back out. This is when I started enjoying the painting, I liked the very visible brush strokes. Beginning the clouds. I might have done them too bright. I glazed them back a little but the damage was done. If I were to do it over I probably would have done them lighter. This is one (above) most accurately shows the color. 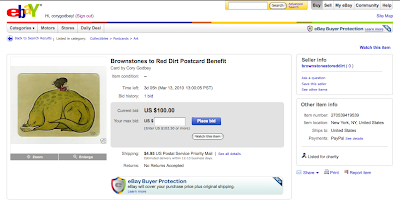 "Brownstones to Red Dirt" charity art auction is live! Remember this one? The auction is live! Only three more days to bid. 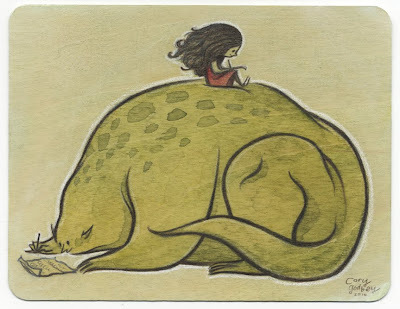 These last few months have certainly been the times of charity art auctions for me. This piece for Brownstones To Red Dirt marks the third of such endeavors. I'm pleased to do them and I do enjoy contributing in some small way, plus it's always fun to get an excuse to do a one-off, unrelated to any other project piece. The theme of sorts is pen-pals and all the art has been made on these little wooden postcards. It was an interesting surface to try and work on. I was expecting the watercolor to bleed a little but it actually stayed put pretty well. 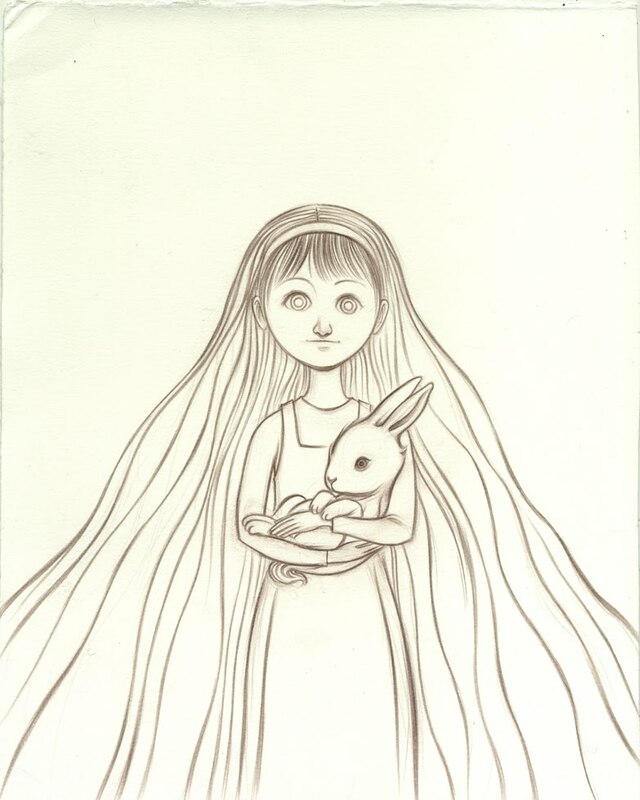 Other contributors to the auction have used more opaque media and I wish I would have tried something like that but I stupidly left myself little time before I needed to mail the actual piece. I'm happy with what I ended up with in any case, it feels pretty standard "Cory" to me, which is what I wanted for it. Once again, here's the auction. Happy bidding! 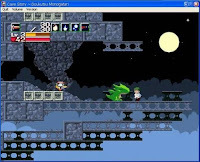 Quite possibly the greatest independent video game of all time, Cave Story is seeing a release on the Nintendo WiiWare service at the end of the month. It was originally created and developed by one person, "Pixel" otherwise known as Daisuke Amaya. That's incredible, I don't know what else to say about it other than I have the utmost admiration for that. The game was 5 years in production and it has since gone on to become one of the most respected and beloved independent games ever created. 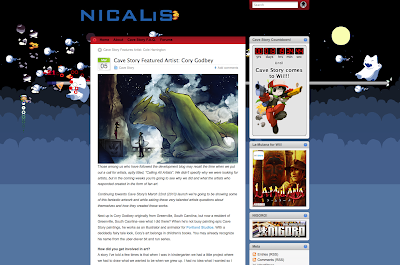 Several months ago, I was asked by a top member of the WiiWare release development team to create a piece based on the game. I decided to do two, an iconic "hero" piece and a recreation of a moment from the game. As I understand it, they have been printed on canvases and will be sent out to "editors of the media." 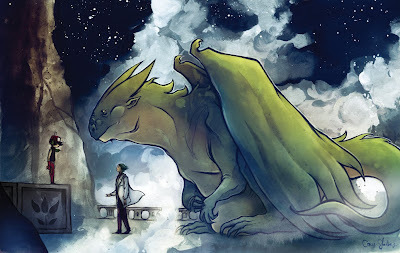 I was recently interviewed over on the publisher's site about the work. Enjoy! Here's the scan of the finished drawing. I'm not certain what day next week we'll be painting though, but surely I'll find something ludicrous to post Monday in case I don't have the next step in this painting. This Friday is bit and run as usual. Michael Dooney said... Uh even after two posts I'm not quite following what the "new Method" is ;) Are you saying that you are painting on a gessoed board instead of watercolor paper???? The new method is the painting, the drawing is pretty straightforward at this point. nicholas said... Cory, I totally understand drawing over too much texture. I don't like it either. Did you use a different pencil or something to offset this? Sort of, I used a regular pencil like I usually do for most of it, but for some areas I experimented with darker ones -- 5Bs and 8Bs. In the end I was happiest with the way the mechanical pencil covered the texture but more pleased with the values of the darker Bs. Awesome! No definitive solution! 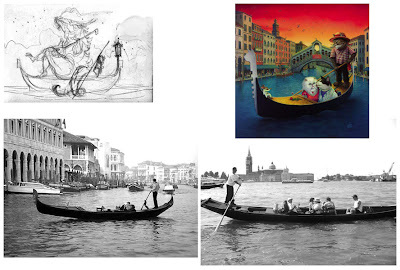 Ok so here we are, as you can see I went with the gondola, though counting votes here and abroad, the two ideas were nearly tied. 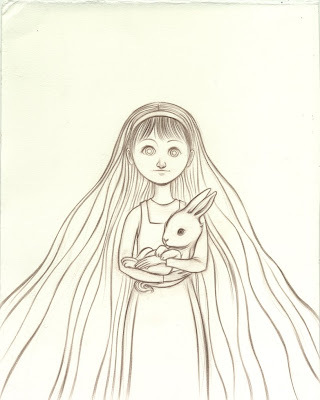 I'm thinking the next one will be the Alice piece. Just a note, at the bottom of this post I'm going to try and answer the couple of comment questions from the first "new method practice" post. One other note, I had a bad time trying to get pictures of the shiny graphite. The board was interesting to draw on, I didn't like it as much at first but it began to feel better. It felt too textured for my liking. This was probably the only decent picture I could get, at this angle. 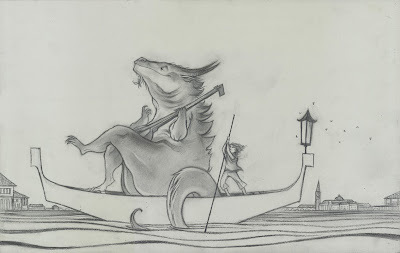 So the next step is finish the details, the boat, and the water. I'm going to leave the sky for the paint. The pencil erased well off the board but not completely clean. It was a little more textured than I like but after a while it began to feel ok. So, ThinkBaker said... What type of board is it? Watercolor board? Illustration board? I think it's a shelf, honestly. Annie gave me the board (literally board) primed and ready to draw on. Josh said... I think the gondola is similar to another piece you did a while back when reveaing your new set of projects, TYE, and the others. Did you reveal all of those by the way? The gondola idea is one that I've had kicking around for a while and for testing out this new method I wanted something familiar to work with. To answer your question, Project Gondola is on hold due to client work, Project Daylight was all the SDCC 2009 work, though Daylight had some specific pieces of work that didn't make it in time and those are back in the pipeline.